Thanks for being a partner in #WearOrange Weekend 2018! This toolkit includes messaging and social media content that should be helpful in promoting your involvement in #WearOrange and giving participation guidance to your followers and supporters. On National Gun Violence Awareness Day, June 1, Americans across the country will be wearing orange. It is a simple, but powerful, statement — and when we all act together, we can’t be ignored. On June 1st, our social networks, our monuments, and our communities will light up orange, standing together for a bright future free from gun violence. Why Orange? Because Orange is what hunters wear in the woods to protect themselves from harm. Orange is a bright, bold color that demands to be seen. Orange expresses our collective hope as a nation– hope for a future free from gun violence, where our movie theaters, our concerts, our places of worship, and our schools are free from gun violence. Orange is the color that Hadiya Pendleton’s friends wore in her honor after she was shot and killed in Chicago at the age of 15 – just one week after performing at President Obama’s second inaugural parade in 2013. After her death, her friends started to Wear Orange to raise awareness about gun violence. And what started with a group of friends on the South Side of Chicago has turned into a nationwide movement to honor the 96 lives cut short and the hundreds more injured by gun violence every day – and to demand action. This movement is powerful when gun sense activists come together to ﬁght for a future free from gun violence. Wear Orange Weekend is an opportunity for us to show the country just how powerful we are. Wear Orange Weekend starts on June 1 — National Gun Violence Awareness Day — when people will be showing their support for gun violence prevention online. It continues through the weekend with hundreds of events, including rallies, marches, BBQs, and more planned by thousands of gun sense supporters like you. Oﬃcial hashtag for all platforms: #WearOrange Please use this hashtag in all of your #WearOrange posts so we can tie the conversation together and show the scale of the movement. Tell your supporters to #WearOrange on June 1, which is National Gun Violence Awareness Day. Invite your supporters to join events throughout #WearOrange Weekend, June 1-3, by texting ORANGE to 644-33. Let your followers know that #WearOrange starts on Friday, June 1, which is National Gun Violence Awareness Day. June 1 is National Gun Violence Awareness Day. Are you ready to #WearOrange? To ﬁnd a Wear Orange Weekend event near you, text ORANGE to 644-33. Download English image for Instagram, Facebook & Tumblr here. Download English image for Twitter here. Download Spanish image for Instagram, Facebook & Tumblr here. Download Spanish image for Twitter here. Help your audience learn more about #WearOrange and the gun violence prevention movement. Let’s turn America orange for gun violence awareness during #WearOrange Weekend, June 1-3. Learn more at www.wearorange.org. Download MP4 for Instagram and Facebook here. Download GIF for Twitter and Tumblr here. Ask your followers to sign up for a #WearOrange Weekend event near them. On June 1, National Gun Violence Awareness Day, wear orange, a color so loud it can’t be ignored. Text ORANGE to 644-33 to ﬁnd a #WearOrange Weekend event near you. Download image for Instagram, Facebook & Tumblr here. Download image for Twitter here. Remind your followers to #WearOrange on June 1. Let’s paint America orange for gun violence awareness! #WearOrange on June 1 and share your pics on social media! Give your audience a ﬁnal reminder to #WearOrange tomorrow. 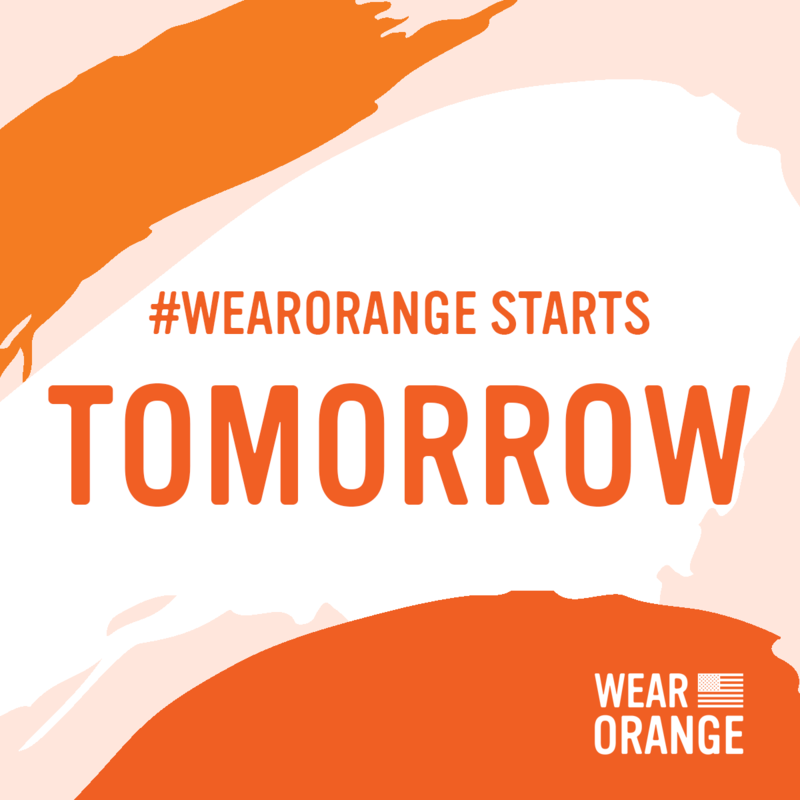 Tomorrow is National Gun Violence Awareness Day and the ﬁrst day of Wear Orange Weekend! Remember to #WearOrange to show your support for survivors of gun violence, and post a selﬁe wearing orange gear! Turn your social media profile pictures orange. Today, I #WearOrange to give a voice to the 96 Americans who die and the hundreds more who are injured by gun violence every single day. Why do you #WearOrange? Text ORANGE to 644-33 to find a #WearOrange Weekend event near you. Ask your followers to turn their social media profile pics orange. Remind your audience to sign up for a #WearOrange Weekend event near them. #WearOrange weekend events for gun violence awareness are happening across the country! Find one near you: Text ORANGE to 644-33. Remind your followers to post pics from Wear Orange Weekend events with the #WearOrange hashtag. Attending a #WearOrange weekend event today? Share your pics on social media with the #WearOrange hashtag. #WearOrange Weekend events are happening in every state to raise awareness about gun violence. Show how your state celebrates Wear Orange Weekend: Post your pics with the #WearOrange hashtag!